- Added a numeric keypad option for entering a wine's list price following a user suggestion (thanks Robert!). - Added service charge presets to jump to common values. - Added Search History so you can keep track of your past searches. Tap on an entry to perform the search again. We regularly add features to Wine Search suggested by users - if there's something you'd like to see in the app, let us know at support@wine-search.info or through the Send Feedback option in the app. Looking for good value wine? Wine Search tells you which merchants stock a particular wine and at what price, allowing you to compare the price on a restaurant wine list or in a shop with the retail prices being charged elsewhere. As featured in the Sunday Times and the Guardian. • Compare the wine price in a restaurant or shop with the best price. • See the mark-up a restaurant is charging on a wine. • Find merchants that sell a wine you want to buy. • Enter a vintage directly or let Wine Search help you. • See the main grape variety and region for a particular wine. • Call a merchant directly (iPhone only) and view the merchant's location on a map. • Use Wine Search while travelling by changing currency and location. • See the range and average of real wine prices when wine shopping. Wine Search calculates the level of mark-up made by a restaurant. Use Wine Search to find out the best value wines on a list, so you can order your wine with confidence. Wine Search also tells you the main grape variety and region of the wine being searched for. You can enter a specific vintage of a wine, or let Wine Search find the prices of different vintages for you. All you do is type in the name of the wine, and (optionally) the list price that the restaurant is quoting; Wine Search calculates the mark-up level for you. You can even enter the service charge too if there is a fixed service charge applied at the restaurant, and Wine Search will adjust the mark-up level to reflect this. Wine Search copes with sales tax/VAT too. By knowing the mark-up level that the restaurant is applying, you can decide whether to splash out on something special, or instead find a bargain. Either way, you will know how much the restaurant is adding to the retail price, and where to buy that wine if you like it. 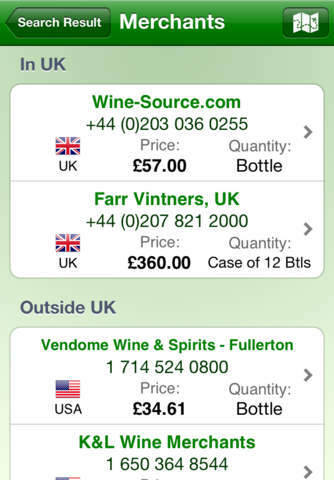 Wine Search is also useful if in a wine shop, as you can see the lowest, average, and highest prices being charged elsewhere (the wine prices used are those supplied to the well-known Wine-Searcher database). Wine Search finds merchants stocking that particular wine and lets you compare prices, so making sure that you are not paying over the odds. Finally, if you are a sommelier, Wine Search conveniently calculates the gross profit on a given wine. "★★★★★ Very user friendly. So far has found every wine I've asked it about and presents the info beautifully clearly." "★★★★★ Ideal app for the real wine lover." "★★★★★ Never let me down yet."